This past year, I set (and kept!) a resolution for the very first time in my life. At some point near the end of 2015, I decided that I wanted to start making my bed. Doesn't really seem like a big deal, but as someone who works from home, my bed was pretty much always visible, and having a big giant messy thing in my face constantly wasn't doing me any favors. So when I woke up on January 1, 2016, the first thing I did was make the bed. Then I did it again the next day and the day after that, and just kept going until it somehow became a natural part of what I did every day. There were even some days when I left it so late in the day that I essentially made my bed about an hour before getting right back into it. (Still counts!) But, for the most part, it's how I started each and every day last year. And after a while? It started to feel really good. 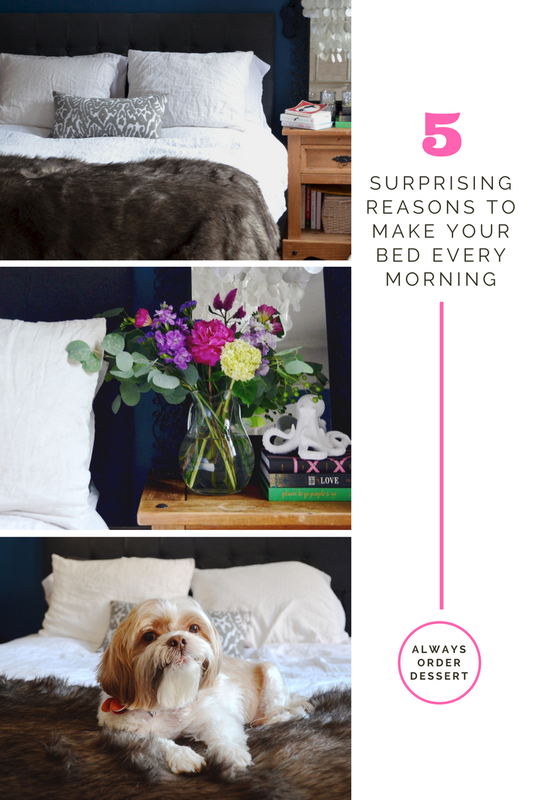 Here are 5 things I learned over the past year of making my bed nearly every morning--perhaps they'll inspire you to give it a try, too! Here's the thing about making the bed; it doesn't take much skill or effort or time. 30 seconds to a minute, maybe two if you're fancy and have a lot of throw pillows. But that doesn't matter, because once it's done, it's done. It's a task you've completed. It's one thing you can check off before moving on with your day. No matter what else you do, at least you have that. If you've ever found yourself saying something along the lines of "Ugh, I've done NOTHING today," then you need this. Because no matter what, you did do something. You made the bed. And yes...that totally counts. Your bed is probably the biggest thing in your room. Likely even the biggest thing in your entire home. When it's a disaster, it gives the whole room (or even apartment if you live in a studio or home with an open floorplan) a look of chaos. But when that bed is made? Instant transformation. Suddenly the other small bits of mess or clutter look like anomalies rather than the norm. Another bonus? There is something about the made bed that seems to bring on other acts of cleaning. You pick up the pair of pants your dropped by the bed the night before. The empty water glasses. The discarded shoes. That one good choice will lead to others. It's kind of magical. I work from home, and while I am totally cool with a bit of artful clutter (piles of books are my jam! ), I find that I get more done when the place is relatively neat. An unmade bed is a task waiting to be done, and having it there waiting and present in the background causes stress. You'll sleep better in a crisply made bed. Straight sheets, fluffed comforters, and pillows whose pillowcases are not half-falling-off make for a better night of rest. Think about how you feel when you get back to a hotel room after a day of exploring and the bed is made. It feels deliciously satisfying to pull back the sheets and climb in, doesn't it? There is a feeling of order and freshness that helps the cares of the day fall away. You're never going to get that from a tangled and rumpled pile of sheets. You're also much more likely to change the sheets more regularly once you get into the habit of making the bed--another habit that's important for both better sleep AND better health. I'll admit I'm not one for routine. There are very few things I do every single day with any sense of regularity. Even my poor dog can't count on dinner at the same time every night (sorry, little dude!). But making the bed has turned into a bit of a morning ritual for me. I'm self-employed and generally have at least half a dozen different work projects going on at a time (often even more!). I also have major ADHD (the actual diagnosed-by-a-doctor kind), which can often make figuring out what to tackle first each day something of a roadblock since everything always feels equally alluring. But I don't have to worry about that now because I already know what my first task is; it's making the bed. And since the act of doing so is fairly meditative, it's often just enough of the push I need to figure out the rest of my day. I think the most remarkable takeaway about this whole experiment has been how very possible it is to create a new healthy habit. Making the bed is now second-nature to me. I went from never making the bed, to consciously deciding to do so each day, to not even having to think about it. I've learned the pattern for creating healthy habits, and that's an invaluable tool that I can now use to tackle even bigger goals. Now I'm curious--do you make your bed regularly? I'd be interested to know why or why not. And are there any similar habits that you've incorporated into your life thanks to setting a resolution?